The Washington State Envirothon is an annual natural resources competition in which high school youth demonstrate their knowledge and problem-solving skills on the topics of aquatic ecology, forestry, soils & land use, and wildlife. Regional competitions take place throughout the state in the spring of each year, and the state competition is held in mid-May. The Washington State Envirothon champion team wins the opportunity to travel to the NCF Envirothon to compete against other winning teams from the United States and Canada. The fun and competitive spirit of Envirothon motivates students to learn about real-world problems and solutions. Today’s Envirothon students will become tomorrows leaders. *CASEE Envirothon members meet in concurrence with FFA throughout the year. 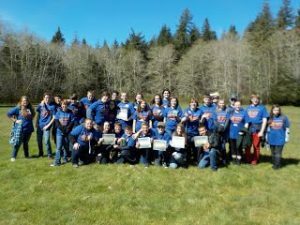 On March 31, 2016, the Envirothon CASEE teams traveled out to the Wahkiakum Conservation District in hopes of winning some, if not all, of the awards. To prepare for Envirothon, all the teams spent months in advance sacrificing their work days and after school hours. We held mock presentations, spent long amounts of time studying different topics, and listened to informational lectures. The drive there was long, but in the end, worth it. Upon arrival, we all assembled into our groups and began. There were six different stations; forestry, current issues, wildlife, aquatics, soils, and the presentation. Each group rotated through the stations and had to take a team test. The presentation, in my opinion, was the most difficult. What made it so difficult, for me, was that we were given a random scenario and thirty minutes to prepare a presentation. We had to use what we already knew. After all the teams completed the tests, we made our way to the commons to eat and hear the results of our hard work. In the end CASEE teams won first, third, and second place. We also won all the individual categories but aquatics. Our first place team, which consisted of JP Kellstadt, Ryan Koskiniemi, Devon Millet, Ian Scott, and Mikayla McDonald, get to go to state and represent CASEE. All in all, the trip was fun and successful.